The Final Trial is the last challenge you’ll undertake in Champions’ Ballad, the newly released DLC for Zelda Breath of The Wild. It will see you descend into previous unknown depths of the Shrine of Resurrection, solve a handful of puzzles, fight the monk Maz Koshia and finally get your hands on the Master Cycle Zero. It’s a lot of work, and the puzzles are nothing to sneer at. Since a lot of players are bound to get stuck here, we’ve decided to write a guide about Zelda BoTW Final Trial & Monk Maz Koshia boss fight. 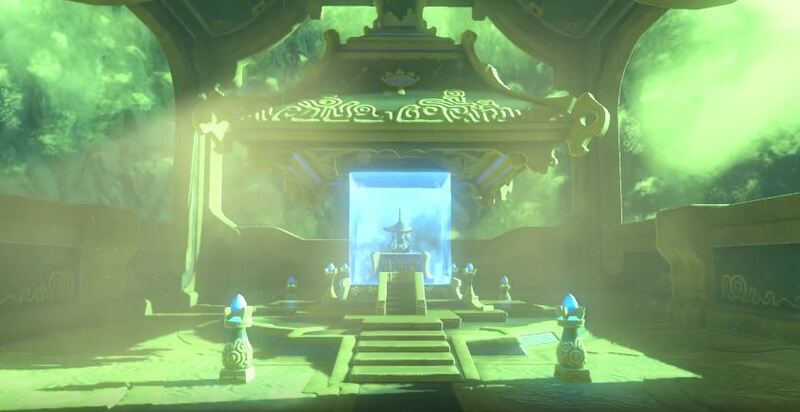 The trial only becomes available after you’ve completed all four champion’s songs (Revali, Mipha, Daruk, Urbosa), as well as the Obliterator shrines. A voice will beckon you to the Shrine of Resurrection, and your Sheikah Slate will reveal hitherto unknown chambers. You’ll have to activate four terminals in order to gain access to the boss room. The first room on the right has a pool of lava, with a bridge covered in spikes going across it. Wait for the bridge to get into a good position – one where the clear space is halfway between the sides – then use stasis on the gear in the distance. Once you’re across, you’ll have to get a ball into the winding tube on the gear. Stand on the button at the right time, and the ball will fall into the tube. You’ll then have to switch the direction of rotation in order to get it to the exit. Pick it up when it falls onto the platform, then place it onto the ramp behind you. Once it falls into position, it will open the cage with the terminal. The first room on the left is supposed to rotate together with the cogwheel in the hall, but it’s stuck. You’ll need to move a piece from the main gear in order to connect it. Once inside, climb up the wall on your left to get to the service platform. Pull out the piece that’s stopping the middle section of the room from rotating, then place it into the slot in the middle of the final section. Slide the piece that almost touchest it – this will extend it, letting you rotate the whole room. Now you just have to wait for the terminal to get down. The room on the far right is a wind tunnel. In order to get in, you’ll need to find a protruding block above the entrance. Grab it, pull it out, take a few steps back and slot it into the opening above you. Pull onto it the part of the main gear next to it, and you’ll open the room. Once you’re in, climb the ladder and turn around. Change the direction of rotation, then glide to the platform above the door. Go up the ladder, then change the direction again. Glide to the platform in the middle of the room, then use Stasis on the fan and glide behind it. You’ll see a cogwheel with loose cogs in front of the room in the far left. Use Stasis on one of the cogs, and it will make the room accessible. Go down to the water, then make an ice block below the piston. Once the platform starts moving, let it take you up. Glide towards the light and follow the hallway. Use Stasis on the winch and hit it as many times as you can. It will drain the water. Jump off the platform and go to the other side of the barrier. Stand on the button to move the block, put the ball in front of it, then stand on it again. Once the water is back up, use an ice block to reach the terminal. Once you’re done with the puzzles, you’ll be able to slot the giant cogwheel into the door, which will allow you to reach the inner sanctum. Talk to the monk, and prepare to fight. The first phase is simple – he can charge at you or dive from above. Both are clearly signalled and easy to avoid. When you dodge them, just hit him as much as you can. In the second phase, he’ll start summoning clones. Use the camera to figure out which one is the real monk, then focus on him. After a few waves of this, he’ll grow to a troubling size and start throwing grenades at you. When he’s done, he’ll start priming them – use Magnesis to grab one and bring it near him. When it blows, it’ll stun him. Run up to him, use Stasis and start whacking like crazy. In the final phase, he’ll try to stomp you while summoning little copies of himself. Ignore them and focus on the giant, and you’ll be done soon enough.